Cheers! Grab a cup, glass, mug - or what have you - and raise it. The moment we have been waiting for is here! What I'm referring to is not the count down to 2013, that the decorations are put away, or that the kids go back to school soon. 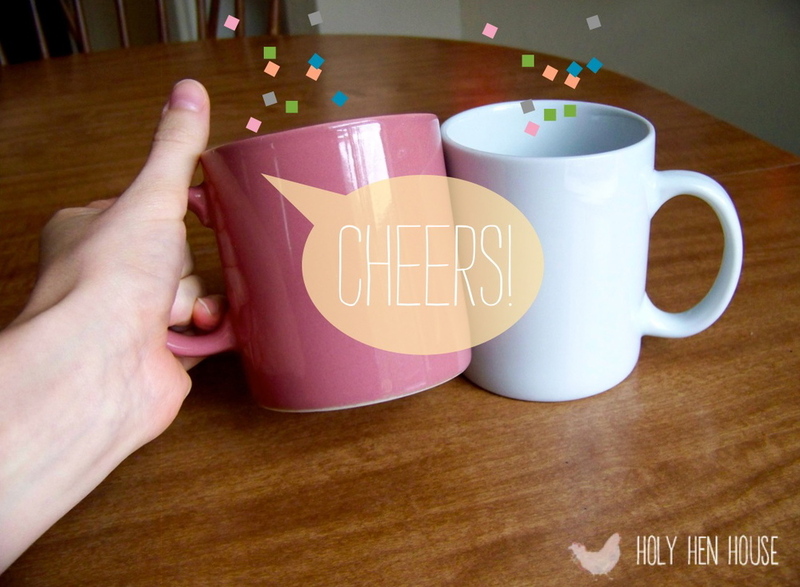 For us ladies at Holy Hen House we are celebrating the opening of our collaborative blog. We hope to inspire each other to embrace the unique roles God has given us women. We will encourage not with empty talk or gossip but with Christian friendship, discernment from God’s Word, and if need be, tough love to steer each other back to God’s will. We will encourage one another with chatter that matters. You see, the vision of Holy Hen House began last June. We naively thought - "All right! Give us two months and we'll have this up and running!" Well, being friends is one thing and collaborating with friends to design and feature a blog is another. The statement 'too many hens in the hen house' wasn't far from ourselves. We decided on the name, changed it, changed it back, made several moves, planned Google hangouts, received anonymous gifts, lifted up prayers, one of us had a baby, changed designers, and celebrated the holidays. whew! Finally, Holy Hen House is ready - and later than we expected by half a year! Often occasions that happen not as planned are the ones that can be the most fulfilling and turn out better than originally intended. This is one of those times. Let me just take a moment and say how privileged we were to work with designer and illustrator Joy Laforme. You can find her busy at work here. Joy's name suits her and her grace and talent were exactly what we were praying for. Last summer we were crammed in my apartment with drinks and creative ideas trying to brainstorm our blog. This memory makes me smile. None of us knew how we would get here or if we would at all! However, we shared the trust that what we were doing would glorify our Lord and that he would guide us. Did moments get difficult? Absolutely! Can doubt keep you up at night? Yep. Faith is what sees us through. We trust that when our plans don't succeed God's will is better. In fact, God's will is perfect. Now listen, you who say, “Today or tomorrow we will go to this or that city, spend a year there, carry on business and make money.” Why, you do not even know what will happen tomorrow. What is your life? You are a mist that appears for a little while and then vanishes.Instead, you ought to say, “If it is the Lord’s will, we will live and do this or that." As this year begins I am reminded that every day is a moment of grace. Here at Holy Hen House we will share women who inspire us as mentors, devotions from God's Word, creative projects, delicious and healthy (sometimes junky) recipes, anecdotes that will make you laugh or at least smirk, and ultimately ourselves - daughters of Christ - humbly equal and holy in Christ alone. So join us, grab a cup of coffee, and draw inspiration from our adventures in loving our families and thriving (or not!) in the home. SHARE! What is one moment in your life that did not happen as planned but God turned out for the best?